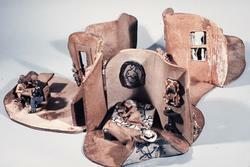 ONCE UPON A TIME (1989) clay, wood, burlap, 63 in. x 48 in. x 14 in. Her work has always had a deeply human component that shows a concern and feeling for the human condition. She aligns herself with the humanistic tradition of artists. Her admiration for Kathe Kollwitz, Honore Daumier, Rembrandt is clearly felt. She is a social critic as well as a witness to life's injustices. Her themes take on the family, cycle of life, alienation from society, and homelessness. As early as 1980 she was making constructions on political themes. FACE OF THE ENEMY (1980) is a ceramic essay on the disasters of war. In it she begins to create a formula for her work. Using slabs of clay she creates broken walls that surround a family that has been bombed out. Broken furniture and injured people swirl through construction showing the devastation of a bombing. Her thoughts are clear: This is wrong. Something in the human values has been broken that such devastation can be put on fellow human beings. Or is it that that the instruments of war have been sharpened. and what has existed for the ages of man, WAR, has continued. These clay pieces were heavy, cumbersome and eventually gave way to ceramic figures in wooden structures, a lighter more efficient solution. 1985 CityStreets #1 with man in sleeping bag showing a homeless man encamped in a stairwell. Living on Staten Island Grabel worked in the city and passed a new presence on the Streets, the homeless, in her daily commute to work. A 1989 signature piece ADDRESS UNKNOWN shows a woman sitting on a bench surrounded by her bags of belongings. The bags are all separately created with clay and glazed. Now in 2012 I realize that this iconic figure of of a homeless woman is less and less seen with the new Bloomberg policies intact. But in the 1980s it was quite common to see the homeless encamped around the city. 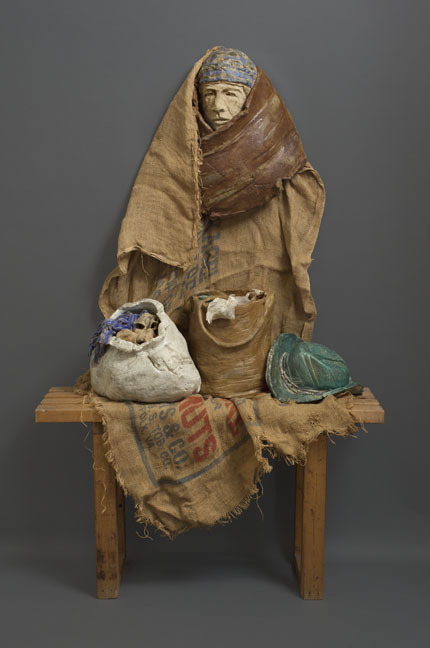 In a 1989 piece ONCE UPON A TIME Grabel creates another homeless woman using a ceramic head and colored burlap attests to Grabel's ability to create a figure through suggested volume. The inspiration for this piece came from a conversation with a homeless woman in which the woman imparted that as a girl she took piano lessons. Grabel's interest how a young girl becomes a alienated homeless person is essayed in this piece. 1990 brought a new phase of her work. Grabel began volunteering in project Hospitality. An organization devoted to the care of the homeless. She became aware of the reactions of people to the homeless. She began a series of heads imprisoned in wooden boxes. Faces insensitive to the homeless and misery of our lives thus alienating themselves from their feelings and humaness. Imprisoned in boxes of non-feeling. The heads are sensitive portraits she gleaned from the newspapers. Her next concern became the female body, not as seen in pop culture but the reality of woman marked by the passage of time. 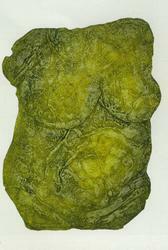 EARTH VENUS, collograph monoprint, 14 in. x 19 in. She began sculpting the female form -- torsos of mature woman using women in her life as models. She created clay figures. She made paper casts of these figures to keep up with her direction of lighter more manageable art. These paper casts took on a variety of embodiments. She began to cut them up and assemble them into unfolding flowers. Around this time she began to talk to master printmaker Herman Zaage. Zaage informed her of a printing technique 'collography". This is using paper plates to create prints. Zaage came up with the idea that if she crushed her paper casts of figures she could then use them as plates and print them. What ensued was a long line of elegant prints using the bodies of mature woman, sometimes overlapping sometimes singular but using seveal colors rubbed into the plates to produce images of surface depth. This exhibit traces 40 years of her work and gives a clear estimation of Grabel's artistic and human concerns.